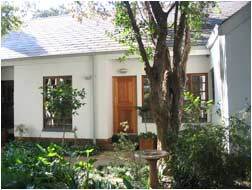 The Village Bed and Breakfast is a comfortable, private cottage, situated in the tranquil surroundings of the Irene Security Village. While being situated close to the major businesses and modern new shopping centre of Centurion, the visitor will enjoy the old world charm and sense of history, found in Irene. The Village B&B is within easy reach of the Johannesburg International Airport, Unitas Hospital, Rietvlei Nature Reserve and the Centurion Cricket Stadium. It is also close to many historical sites such as the Irene Concentration Camp graveyard, Irene Post Office Murals, the Smuts Museum and Cornwall Hill. * A tastefully furnished bedroom with double bed and view of the garden. * En-suite bathroom with shower and WC. * Comfortable lounge with television and MNet. * Well equippped kitchenette with self-catering facilities, including a microwave oven and a fridge. * Bedroom with one/two single beds and view of the garden. * En-suite bathroom with bath, shower and WC. * Tea/Coffee - making facilities. * Part of main house but has own private entrance. Both facilities offer a choice of delicious breakfasts, work space for the business person, fans/heaters and braai facilities.